Tri-County Animal Hospital is equipped with state-of-the-art surgical suites and highly trained veterinarians who perform a variety of veterinary surgical procedures. Our modern surgical suite is equipped with the latest patient monitoring equipment to ensure the health and safety of your pet. Prior to surgery, our veterinarians will perform thorough examination and conduct a pre-anesthetic blood test to evaluate the function of the internal organs. After examination, anesthetic drugs are individually selected for your pet based on the procedure, their age, breed, and health, and lifestyle. Soft Tissue/General Surgery - These are surgical procedures that are not associated with bones. Common soft tissue surgeries performed: spays, neuters, foreign body retrieval (laparotomy/gastrotomy/enterotomy), mass removals, bladder stone removal (cystotomy), pyometra, splenectomy, mastectomy. Orthopedic Surgery - Orthopedic surgery corrects musculoskeletal conditions such as degenerative joint diseases (hip dysplasia, other forms of arthritis), knee pain, joint injuries, and spinal conditions. 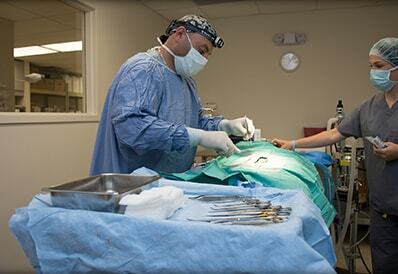 Please call us at (973) 831-2426 if you have any questions regarding our surgical procedures.